Amid the blockbusting swelter of summer’s capes, cowls, spandex and ‘splosions, Cleveland Cinematheque’s foreign and arthouse offerings are a welcome change, even when their topics are a bit more dour than your typical Memorial Day weekend fare. 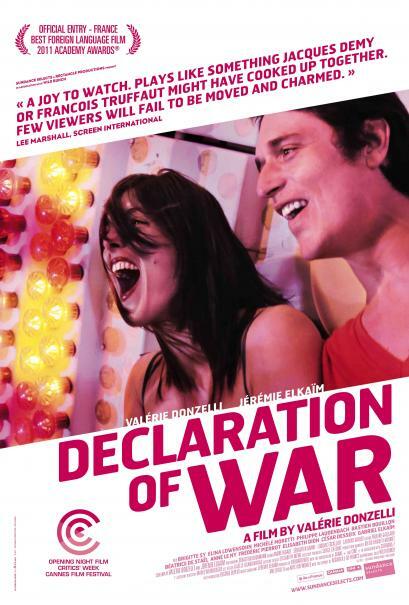 DECLARATION OF WAR (La Guerre Est Declaree), for example, tells the story of a young French couple (a bit cloyingly named Roméo and Juliette) whose infant son is suffering from a large, and possibly malignant, brain tumor. And while the movie, which France submitted and Oscar failed to shortlist for this year’s Best Foreign Language Film, may not have the first date-ready shenanigans of a MEN IN BLACK 3, it’s more upbeat and energetic than one might expect, championing hope over grief, and playing fast and loose with narration and editing in all the jazzy little ways that shout post new wave. Written by and starring Valérie Donzelli and Jéremie Elkaïm, and directed by Donzelli, the film is a semi-autobiographical retelling of the young parents’ struggle with their son Gabrielle’s (named Adam in the film, but played by their real son Gabriel and, in the character’s early years, by actor Cesar Désseix) medical nightmare, and their ultimate decision to ride out the illness in a self-imposed state of aggressive joy and carve out a livable nook in the inhospitable landscape of tragedy. The story is told in flashback and narrated by various parties as Juliette waits for the results of one of Adam’s CAT scans. As she stares blankly at the hulking machinery into which her son is swallowed, the rhythmic mechanical belching of industrial music whisks us off to the house party where she and Roméo originally met. “So we’re doomed to a terrible fate?” he flirts, after learning her name. If only they knew. The child is born early in the relationship, and handed his grim diagnosis only two years later, meaning mom and dad have only just learned to function as an adult couple when they become parents, and have only just grasped the bear fundaments of parenthood when they’re confronted with the reality of Adam’s illness. The speed of it all is reflected in multiple musical montages featuring the couple in motion - charging forward through Paris in exuberant passion, driving panicked through harried traffic, and flailing down hospital hallways in paroxysms of grief - the soundtrack hopping from classical to contemporary as mother and father are repeatedly built up and razed by the spastic articulations of fate and their own grappling attempts to subdue it. Folks who have lauded the film for maintaining a bearable (I won’t go as far as to say entertaining) tone in the face of a nightmarish subject matter are on point at least in as much as DECLARATION isn’t nearly as depressing a it could be. There’s very little wallowing navel-lookery, and the story seeks to explore the human potential for steely resolve, and, more pointedly, advocate for an individual’s right to personal enjoyment and self-fulfillment – the right to batter back society’s expectation of veil-draped, handkerchief-smeared tearfulness, and maybe hit the amusement park – in times of extended hardship or grief. Certainly, its artful filmic hijinks, which, without ever feeling suffocating or overly precious, manage to deliver things like a mid-film musical number and plenty of playful chip-chop new wavey editing, don’t hurt. But it’s still a flick about an unstable couple’s journey through the dark uncertainties of medical hell. Actually, the film’s handling of modern medicine – from hospital bureaucracy to the sterile mysteries of invasive procedures and gargantuan machines – is one of the film’s more finely honed aspects. Rather than portray medical science as an overstocked arsenal of knowledge and skill, Donzelli portrays medicine and, moreover, its inevitable administrative tentacles, as a mystery uncertain and incomprehensible as the tumor itself. Without ever suggesting that science is anything short of miraculous in the results of which its capable, the film suggests that the machinations of hospital hierarchies and procedures, from intake to recovery, comprise an insular and cryptic society all its own, with laws built upon enigmatic policies and an endless, rhythmic series of hurry-up-and-wait routines conducted to sustain an eternal balance between medical urgency and legal liability.